The simple Evaporator is generic "heat exchanger" model without regards to its heating media or equipment size. It is only designed to give estimates of Duty required by evaporating the required amount of material. Only a single component can be evaporated at present, this is set on the VLE tab, examples are: H2O(l) or NH3(aq). The diagram shows the default drawing of the Simple Evaporator, with the required connecting streams. The unit will not operate unless all of the above streams are connected. Feed Required In 1 10 Input stream to Simple Evaporator. Vapour Optional Out 1 1 Vapour stream from Simple Evaporator. Slurry Required Out 1 1 Slurry stream from Simple Evaporator. If the Vapour stream is not connected, then all material will exit this stream. If the user disables the unit, by un-ticking the On tick box, the Feed stream will flow straight out of the Product stream with no change in composition; so basically, the unit will be 'bypassed' without the user having to change any connections. This model is used for simple Evaporation, where the heating media is not simulated but the energy required to heat and evaporate the required contents is assumed to be available. The unit will attempt to heat up the contents and evaporate the required amount of the liquid while keeping the contents at the saturation temperature. Duty / Duty Tag: The user specifies how much energy is added to the unit to cause Evaporation. 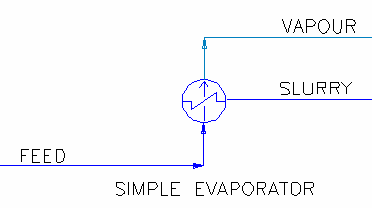 SysCAD then calculates the amount of evaporation based on the external energy added. Mass Evaporated / Mass Evaporated Tag: The user specifies the required mass evaporation rate. Fraction Evaporated / Evaporate All: The user specifies the fraction of the evaporation species in the feed to be evaporated. Saturated T: The mixture will be heated up to the saturation temperature, no evaporation will occur. If the specified duty is not high enough to bring the mixture to the saturation temperature, then no evaporation will occur. If excess duty is specified, after all the evaporation species has been fully evaporated (maybe limited by the MaxEvapFrac), then the excess duty will heat up the product stream beyond its saturation temperature. If the vapour stream is not connected, the SimpleEvaporator does not remove the evaporated species from the unit, they remain with the slurry stream. Relative Humidity method: Warnings will be given if non-condensables are not present in the feed stream. The evaporation unit will evaporate the contents to the saturation temperature based on the pressure, so inlet pressure and entry dP of the feed is important and user should make sure the pressure is set correctly. The pressure of the unit will be set at the Lowest Pressure of all the feed stream less the Entry Pressure Loss. If the feed stream is a mixture of two or more components, then the MaxEvapFrac setting may prevent all the evaporating species being fully evaporated. If limit is reached the unit will display a condition. The simple Evaporator can evaporate ONE single component only. It cannot handle multi-component evaporation. The simple Evaporator has only one one outlet. If multiple stream outlets are required, the user will have to add in a tie unit downstream of the evaporator for splitting. No reactions are allowed in the Evaporator. This model is not suitable for surface evaporation calculations. Please use Evaporation_Block_(Evap) instead. SimpleEvaporator tab - This first tab contains general information relating to the unit. QProd - Optional tab, only visible if ShowQProd is enabled. This page shows the properties of the product. Unit Type: SimpleEvaporator - The first tab page in the access window will have this name. On Tick Box If this option is deselected, the Simple Evaporator will not be operational and thus inlet conditions = outlet conditions. EvaporationMethod / Method Fixed Duty This allows the user to specify the Simple Evaporator duty. The evaporation rate will be changed to match this duty. This will be limited by the MaxEvapFrac Tag, so that the amount of evaporation rate will not exceed the feed rate. Duty Tag This allows the user to set a tag that the unit will 'read' to set the duty. The evaporation rate will be changed to match this duty. This will be limited by the MaxEvapFrac Tag, so that the amount of evaporation rate will not exceed the feed rate. Saturated T The product temperature will be equal to the saturation temperature for the evaporating species (component selected on the VLE tab page). No evaporation will occur. Evaporate All The evaporating species in the feed will be fully evaporated. If the feed contains more than one species, then the amount evaporated may be limited by the MaxEvapFrac Tag. If the feed contains more than one species, then the amount evaporated will be limited to MaxEvapFrac, if it is <100%. If so, warning messages will be given. Mass Evaporated The user specifies the mass of the specified species - either Water or another species - in the feed that is evaporated. If the feed contains more than one species, then the amount evaporated may be limited by the MaxEvapFrac Tag. If the required evaporation amount is higher than available in the feed or has exceeded the MaxEvapFrac, warning messages will be given. Mass Evaporated Tag The evaporation rate will be based on the user specified tag, which sets the specified species - either Water or another species - in the feed to be evaporated. If the feed contains more than one species, then the amount evaporated may be limited by the MaxEvapFrac Tag. If the required evaporation amount is higher than available in the feed or has exceeded the MaxEvapFrac, warning messages will be given. Fraction Evaporated The user specifies the fraction of the specified species - either Water or another species - in the feed that is evaporated. If the feed contains more than one species, then the amount evaporated may be limited by the MaxEvapFrac Tag. If the required evaporation has exceeded the MaxEvapFrac, warning messages will be given. Relative Humidity The user specifies a desired relative humidity. DutyReqd Input This field is only visible if Fixed Duty is chosen for Method. The required duty. Note: Duty entered here should be a positive number as heating is required for evaporation to occur. If the specified Duty is too low to reach the saturation temperature for evaporation to occur, SysCAD will return an error message. If the specified Duty is too high, the product temperature will be greater than than the saturation temperature. DutyTag Input This field is only visible if Duty Tag is chosen for Method. This allows the user to set the duty tag from another unit or from a side calculation. DutyReqd.Meas Calc This field is only visible if Duty Tag is chosen for Method. It displays the actual duty value being used from the linked tag. DutyFactor Input This field is only visible if Duty Tag is chosen for Method. The duty factor. For example: If the duty being linked is -ve, using -1 to change the duty to +ve to provide heating here. VapourQmReqd Input This field is only visible if Mass Evaporated is chosen for Method. The required evaporation rate of the selected species. VapourTag Input This field is only visible if Mass Evaporated Tag is chosen for Method. This allows the user to set the vapour flow tag from another unit or from a side calculation. VapourQmReqd.Meas Calc This field is only visible if Evaporation Tag is chosen for Method. It displays the actual vapour flow value being used from the linked tag. VapourFactor Input This field is only visible if Evaporation Tag is chosen for Method. The vapour factor. Valid range: 0 - 1. FractionReqd Input This field is only visible if Fraction Evaporated is chosen for Method. The required evaporation rate will be calculated based on this value and the feedrate. RelativeHumidityReqd / RH_Reqd Input This field is only visible if Relative Humidity is chosen for Method. The required relative humidity. The maximum evaporation fraction of the evaporation species. Valid range: 0 - 100%. The maximum fraction evaporated prevents the relevant species from being evaporated past a specified fraction independent of other user specified requirements. This prevents all the material being evaporated due an unforeseen circumstance such as a small feed flow. If limit is reached the unit will display a condition warning. EntryPressureLoss / EntryDP Input The entry pressure loss required. The evaporation unit will evaporate the contents to the saturation temperature based on the pressure, so inlet pressure and entry dP of the feed is important and user should make sure the pressure is set correctly. based on the actual duty of the Simple Evaporator. ShowQSlurry Tick Box QProd and associated tab pages (eg Sp) will become visible if this is enabled. These tabs will show the properties of the product stream from the Unit. ShowQVapour Tick Box Only visible if a Vent stream is connected. QProd and associated tab pages (eg Sp) will become visible if this is enabled. These tabs will show the properties of the vent stream from the Unit. HeatFlow Calc The heat flow to the evaporator. This would usually be +ve, indicating that heat has been added to cause evaporation to occur. TemperatureIn / Ti Calc The temperature of the combined inlet streams. DeltaT / dT Calc The temperature difference between the inlet and outlet. TemperatureOut / To Calc The outlet temperature. SatT@PP Calc The saturation temperature at partial pressure. PressureIn / Pi Calc The pressure of the combined inlet streams. PressureOut / Po Calc The outlet pressure. PressureChange / dP Calc The change in pressure. This is set by EntryDP. Duty.Actual Calc The actual Duty of the Simple Evaporator. If one of the Duty methods are used, this is the actual energy added, which may be less than the required Duty if a limit has been reached. For other methods, this is the energy required to heat the contents up to the saturation temperature and to Evaporate the required amount of vapour while keeping the contents at saturation temperature. Duty.Error Calc Only visible if one of the Duty methods are used. The absolute difference between the actual Duty and required Duty. Duty.RelError Calc Only visible if one of the Duty methods are used. The relative difference between the actual Duty and required Duty. VapourFlow.Actual / VQm Calc The amount of vapour in the product stream, this includes the any vapour in the feed + Evaporated Vapour. VapourFracOut / Vfo Calc The product vapour fraction based on the total stream. FlashSpOutVapour / FlashSpFrac Calc The product vapour fraction of the flashed species based on total vapour. For example, if product stream contains a mixture of H2O(g) and N2(g), and the flash species is H2O(g). Then the FlashSpFrac = H2O(g) / (H2O(g) + N2(g)). VapourFlow.MaxLimit / VQm.MaxLimit Calc Only visible for the required Duty methods. The maximum amount of material that can be evaporated based on what is available in the feed. VapourFlow.Requested Calc Not visible for the required Duty methods. The user specified amount of liquid to be evaporated. VapourFlow.Error Calc Not visible for the required Duty methods. The absolute difference between the amount of liquid to be evaporated and the actual amount of vapour in the product stream. Please note that if the feed contained other vapours, then it will show a value here. VapourFlow.RelErr Calc Not visible for the required Duty methods. The relative difference between the amount of liquid to be evaporated and the actual amount of vapour in the product stream. Please note that if the feed contained other vapours, then it will show a value here. ModelDuty Calc This is the actual duty for the simple Evaporator (thus duty calculated in the first tab page). It is used for all calculations. CalculateWhat HTC This allows the user to calculate the required HTC based on Actual Evaporator Duty and specifying Area and LMTD. Area This allows the user to calculate the required Area based on Actual Evaporator Duty and specifying HTC and LMTD. LMTD This allows the user to calculate the required LMTD based on Actual Evaporator Duty and specifying HTC and Area.